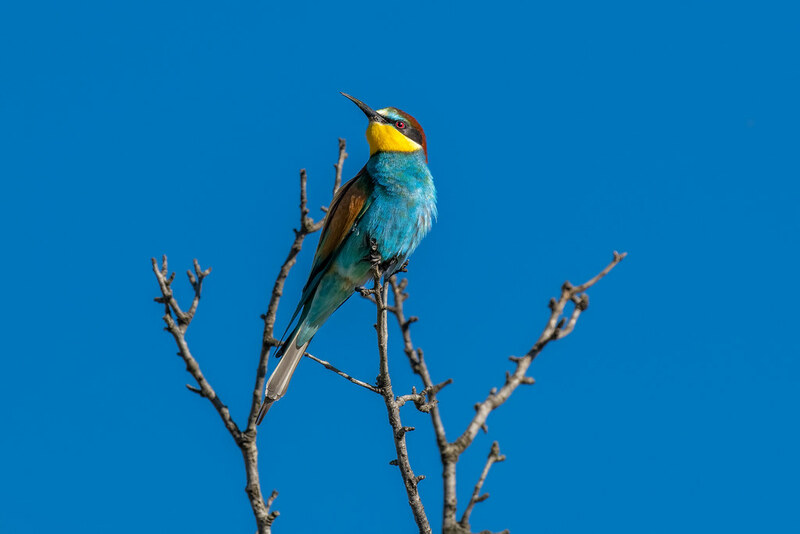 I was out just after sunrise this morning and hidden near the “meeting tree” that the Bee-Eaters have been gathering in. However, today, they chose another tree about 50 meters away. I waited for a while and eventually one pair turned up and got the shot below. Afterwards I was able to walk away and get a good look at them, they have started to build their tunnels in preparation for breeding. In case you don’t know Bee-Eaters dig tunnels in near-vertical banks that they nest in and build new tunnels every year (see video below). Luckily, the land on overlooking this area I where they are building we own and although extremely difficult to get to I will be looking in a way to get closer. Here is a shot that I did manage to get. Here is a video I took 2 years ago when they attempted, but abandoned an area in the garden.